Do you want to know how to track Thrive Leads using Google Analytics? This can be tricky to set up, but it’s possible with the right tools. In this article, we’ll show you the ways you can track both your Thrive Themes and Thrive Leads in Google Analytics. If you currently use Thrive Themes on your WordPress website, you might want to set up Google Analytics tracking of your entire website so you can measure your site’s success over time. Luckily, adding a Google Analytics code to your website is easy to do when you have a Thrive Theme installed. The first thing you will want to do to start tracking your Thrive Themes in Google Analytics is sign into your Google Analytics account. From there, click on the Admin button and look for the website you would like to start tracking. Next, click on the Tracking Info dropdown and select Tracking Code. Copy the Google Analytics tracking code. Next go to your WordPress dashboard and go to Thrive Themes » Thrive Options » Analytics/Scripts. In the Header Script section, paste the tracking code you copied from your Google Analytics account. It’s important to place the tracking code in the Header Script section, and not the Opening Body Script section so that Google Analytics can track data without missing any real time metrics. Save your changes, and that’s it as far as tracking your traffic. By default, Google Analytics doesn’t track conversions of your online forms. So, while you’re receiving valuable information about site visitor behavior and traffic sources by tracking your Thrive Theme with Google Analytics, there is no way to tell how your optin forms are performing without adding a few extra steps. 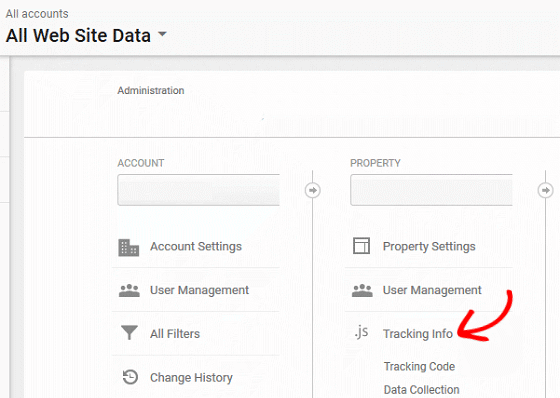 In order to track your Thrive Leads in Google Analytics you need to go beyond simply adding the tracking code to your website. Goals in Google Analytics are a great way to track site visitor interactions with your website. This includes things like sales transactions, button clicks, and downloads. In order for you to track site visitor interactions, you need to define a goal in your Google Analytics account. Then, whenever a visitor fulfills the goal you have set, you are given one conversion count. Upon analyzing your Google Analytics metrics, you will see how many actions your site visitors have fulfilled and how well your site is performing as it relates to the goal you defined. Check out our detailed instructions for creating goals in Google Analytics to track conversions. Sometimes using your Google Analytics account can be overwhelming, and it’s hard to configure tracking beyond the basics. That’s why using MonsterInsights is so helpful. Not only do you get the benefit of having a a simple Google Analytics dashboard right in the WordPress dashboard to track things such as page views, top posts and pages, traffic sources, and more, you can forget about setting goals and track your Thrive Leads using the MonsterInsights Forms addon. With the MonsterInsights Forms addon, you can easily track form views and conversions of any leading WordPress contact form, without needing to mess with code. …and many more tracking features. 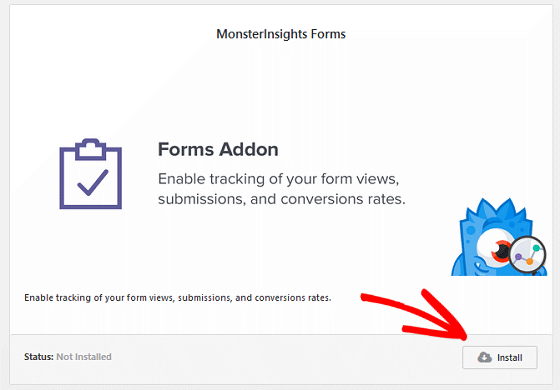 To get the MonsterInsights Forms addon working on your website, first install the MonsterInsights plugin and connect it to Google Analytics. Next, navigate to Insights » Addons and find the MonsterInsights Forms addon. Click on Install and then Activate. And that’s it, you are all done. The MonsterInsights Forms addon is designed to work straight out of the box. In fact, it starts tracking form conversions immediately following activation. That said, if you are using Thrive Leads you will need to complete a few extra steps in order for Google Analytics to properly track all of your form conversions. This is because, unlike the popular OptinMonster lead generation solution, Thrive Leads forms do not give each form you create a unique form name. As a result, Google Analytics cannot properly distinguish between the forms on your website and provide accurate conversion metrics for each. This is why you must manually add a unique form ID on each Thrive Leads form your create. To do this, create a form that you would like to add to any post or page on your website. Now you can edit your newly created form to meet your design and functionality needs. Just drag and drop elements into the template. When you are done customizing your form, click on the Page Setup icon. 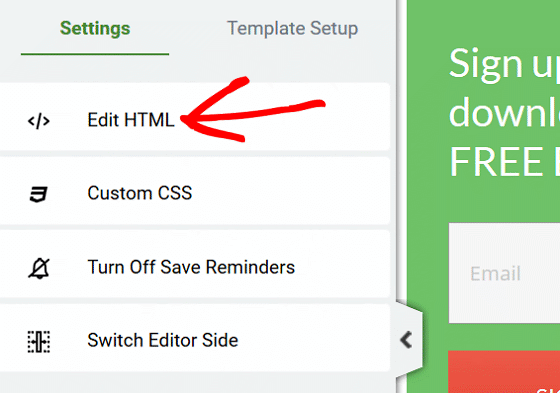 Select the Settings tab and then click on the Edit HTML section. You will notice a screen popup that contains your Thrive Leads form’s code. But don’t worry, the change you need to make to assign a unique form ID is quick and easy. Look through the code and find the <form tag. When finished, click on the white checkbox near the top of the screen. This will ensure your form saves the unique ID you have assigned it. Continue editing your form as you see fit and when you are all done, click on the Save button. The key here is to remember that in order for Google Analytics to properly track your Thrive Leads conversions, each form you create must have a different, unique name. And there you have it. You have successfully set your website up to track Thrive Leads using Google Analytics. To accurately track your mobile users make sure to enable Google AMP on your WordPress website. And, if you want help with ads tracking, check out how to add UTM parameters to your landing page URL. And don’t forget to follow us on Twitter and Facebook for more tips and tricks.